The Italian luxury liner Andrea Doria collided with the Stockholm on July 25th 1956. She rolled over and sank the next morning. 51 lives were lost. By the mid-1950s, with the postwar passenger boom at its peak, more than 50 passenger liners sailed the sealanes between Europe and America. Among the most splendid were two new ships of the Italian Line, the Cristoforo Colombo and the Andrea Doria. They were built for luxury, not speed, and to take advantage of the sunnier southern route. 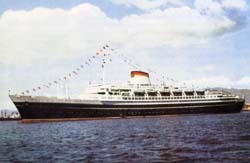 The Andrea Doria was the first liner to possess three outdoor swimming pools, one each for first, cabin and tourist class. Her lines were graceful, her public rooms lavishly decorated and crowded with artworks and her most desirable first-class suites as rarified as any that had come before. She was a superb expression of her time and nationality, a ship that combined 1950s modernity with a keen awareness of Italy’s extraordinary artistic heritage. She was also equipped with the latest in navigational equipment, including two sets of radar, the still-developing technology that had transformed the maritime battlefields of World War II and was now standard equipment in the merchant marine. But even if the radar failed and somehow a collision happened, the Andrea Doria was in theory unsinkable. Her 11 watertight compartments were so constructed that she would remain afloat if any two were breached –more than that her builders could not imagine — and so that she would never take on a list of more than 15 degrees. As an extra safety precaution, her lifeboats could still be launched if the list reached 20 degrees. Yet the Andrea Doria was destined to become the last great lost ship of a transatlantic passenger era that was about to fade away. Her story provides vivid evidence that “despite all the safety gadgets, the mind is supreme and the mind is fallible.” The quotation belongs to Harry Manning, first captain of the record-breaking United States reflecting on the collision between the Andrea Doria and the Stockholm. The same words could equally have been written following the loss of the Titanic or the Empress of Ireland. Add to human frailty a goodly portion of bad luck, and the collision that led to the sinking takes on the kind of inevitability that prompted William Hoffer in his book Saved! to comment that “the two ships seemed drawn together by a magnet of fate.” And despite many hours of testimony after the accident and much analysis, no one will ever be completely sure precisely how it happened. We do know that on the evening of July 25, 1956, two passenger ships were converging on a point southwest of the Nantucket Lightship, which marks the entry to and exit from the crowded approach to New York harbor. The 697-foot-long Andrea Doria, carrying a nearly full complement of 1,706 passengers and crew, was nearing the end of a mostly sunny and uneventful nine-day voyage from Genoa to New York. The Stockholm, at 528 feet in length and only 12,165 tons, one of the smallest of the new postwar liners, was just beginning its homeward voyage to Sweden. On the Andrea Doria’s bridge, overseeing the work of the two senior officers on the watch, stood 58-year-old Captain Piero Calamai, a veteran of 39 years at sea and hundreds of Atlantic crossings. On the bridge of the Stockholm, the ship’s youthful third officer, 26-year-old Johan-Ernst Bogislaus Carstens-Johannsen, was in charge of the 8:30 to 12:00 p.m. watch. It was standard policy in the Swedish Line, as on most liners, for only one officer and two seamen to stand each bridge watch. At 10:20 p.m., the Andrea Doria came abeam of the Nantucket Lightship, and Captain Calamai ordered a new course that aimed directly at the Ambrose Lightship, which marks the mouth of New York harbor. The two ships were now approaching on roughly parallel courses, but being still beyond the range of each other’s radar were as yet unaware of each other’s presence. To complicate matters, the Andrea Doria was steaming in fog, while the Stockholm sailed through a clear night bathed in moonlight. Carstens-Johannsen had no inkling of the fogbank that lay just ahead. Given the circumstances, neither ship was exercising maximum caution. Since mid-afternoon, the Andrea Doria had been steaming through patchy fog, at times dense enough to make the bow invisible from the bridge, but Captain Calamai had reduced speed only a little. He had a schedule to keep, and he was confident that his radar would alert him in ample time to avoid any problems. He had, however, ordered various standard fog precautions: A lookout was posted in the bow and the watertight doors were closed. The Stockholm had as yet no reason to reduce speed, but every reason to expect fog in the waters south of Nantucket Island, where the cold Labrador Current encounters the warm Gulf Stream. Furthermore, the ship was traveling to the north of the recommended outbound route on a course likely to bring it into contact with incoming ships in one of the busiest sealanes in the world. (Many outgoing ships spurned the recommended route 20 miles south of the Nantucket Lightship because it added distance and time.) Yet Captain H. Gunnar Nordenson saw no reason to join his third officer on the bridge. Third Officer Carstens-Johannsen (known to his crewmates as Carstens) was perfectly capable of navigating the ship, even in these treacherous waters, as long as the weather stayed clear. The Andrea Doria, whose radar had a slightly greater range than the Stockholm’s, detected an oncoming ship at about 10:45 p.m. at a distance of about 17 nautical miles. Curzio Franchini, the ship’s second officer, alerted the captain, and Calamai immediately requested the other ship’s bearing. She was only four degrees off the starboard bow — in other words, almost dead ahead. This information didn’t worry the Andrea Doria’s captain or the two watch officers on the bridge. There was ample time and distance to pass the oncoming vessel with plenty of room. They had done so a thousand times before with a thousand other ships. Only one important decision needed to be made — whether to pass the ship to port or starboard. According to Franchini, the oncoming ship continued to bear slight to the right, causing Captain Calamai to begin to think it was a small coastal vessel that would soon turn north to Nantucket. On board the Stockholm, Third Officer Carstens saw things quite differently. He had just picked up a blip on his radar indicating a ship 12 nautical miles away and slightly to his port. Acting according to standard Swedish line procedure, he plotted the course of the oncoming vessel, which required two radar fixes. By the time he’d completed his calculations, the other ship was fewer than six miles away. It appeared set to pass to the north, but by less than a mile. As soon as the other ship came into view, Carstens told himself, he would alter course to starboard, so as to increase the width of their passing distance. After several minutes, he began to wonder why the other ship’s lights did not appear. He could still see the moon and the possibility he was sailing into a fogbank seems never to have occurred to him. Those navigating the two ships racing toward each other at a combined speed of roughly 40 knots had somehow come to opposite conclusions. Aboard the Andrea Doria, the approaching ship seemed to be maintaining a position just off the starboard bow. According to the Stockholm’s radar, the other vessel seemed clearly to be a few degrees to port and on a parallel course. One of the radar sets, or one of the men who read them, was wrong. Given the state of radar at that time and the fact that no ship keeps a perfect, steady course, small errors can be exaggerated. On board the Andrea Doria, such an error might have been caught, had someone bothered to plot the oncoming ship’s course instead of relying on an eyeball estimate from the radar screen, but on the Italian Line such calculations were not routine practice. The men in command on both ships seem to have had more faith in their radar — and their ability to interpret it — than they should have. This faith led Captain Calamai to make one of his most controversial decisions of the night. He decided to pass the approaching vessel starboard side to starboard side. Standard procedure when two ships meet at sea is for a port-side-to-port-side passing, but the Andrea Doria’s skipper thought he had good reason for making an exception. The other ship was already to starboard — or so he believed. A port-side passing would mean crossing her bow and sailing closer to more heavily traveled coastal waters. Given the wide and empty ocean to his left, it seemed natural to stay port and stay clear. About 11:05 p.m., with the other ship about three and a half nautical miles away, Captain Calamai ordered a small four-degree course change to port to increase the passing distance. Neither ship had yet seen the other, except on radar. Just as the Andrea Doria changed course, the two ships finally made visual contact. Only two miles now separated them, a perilously short distance, given their combined speed. They were converging at a slight angle, so that the Andrea Doria saw lights to its right and the Stockholm lights to its left. Thus the first sight of the other ship only reinforced the false assumptions on each bridge: The other vessel was where it was expected. On the Stockholm’s bridge, Carstens now issued an order he might more wisely have given long before — a sharp turn to starboard to give the oncoming ship a wider berth. Unfortunately for him, Captain Calamai remained convinced the Stockholm would pass him safely starboard to starboard. Without realizing it, Carstens was turning his ship toward the Andrea Doria’s course. And he failed to signal his turn with the usual blasts on the ship’s whistle. Then the bridge telephone rang and he turned way to answer it. For a split second, Captain Calamai couldn’t believe what he was seeing. All 39 of Captain Calamai’s years at sea must have passed in front of his eyes in the instant before he called out his next order. Had experience prepared him for this, his greatest test? “Tutto sinistra,” he called out. “Full left.” He would put his faith in the Andrea Doria’s speed and maneuverability, hoping to turn left faster than the other ship was turning right. But a huge ocean liner going nearly full speed doesn’t turn on a dime. On board the Stockholm, Carstens brought his gaze back from the bridge telephone, still assuming all ahead of him was fine. On the phone had been the crow’s-nest lookout telling him what he already knew: The lights of a ship were visible 20 degrees to port. Carstens had turned away just as the other ship began its hard left turn. Now it took him a few moments to grasp what was happening. The stranger was turning across his bow! He wrenched the handle of the engine telegraph to full astern and shouted to his helmsman, “Hard-a-starboard!” It was too little, too late. Had Captain Calamai turned right instead of left, he might well have avoided a collision or minimized its impact. A glancing blow head to head is less damaging than a broadside ramming, but that is what the Andrea Doria received. The bow of the Stockholm plunged into the Italian liner’s starboard hull plates just aft of her bridge, ripping open seven of her 11 decks, the hole reaching almost down to her keel. For a moment, the smaller ship lodged there like a stopper in a bottle, then the force of the water rushing past the Andrea Doria’s hull — she was still moving at almost full speed — tore the Stockholm away. A torrent of seawater began to pour through the gaping hole in the Italian liner’s hull. The time was just past 11:10 p.m.
With the Andrea Doria scheduled to dock in New York early the following morning, many of the ship’s 1,134 passengers, especially those with young children, had already retired. But the moment of collision caught quite a few passengers engaged in final-night entertainments. The dance band in the first-class Belvedere Room nightclub had launched into yet another rendition of “Arrividerci, Roma,” when it literally tumbled off its podium amid a clatter of instruments as dancing couples toppled to the floor. In the tourist-class dining room, where passengers were enjoying a Jane Russell movie called “Foxfire,” the screen went dead and a short-lived panic erupted in the darkness. Throughout the ship, those who hadn’t yet gone to bed rushed to their staterooms, woke sleeping children, grabbed life jackets and a few belongings, then headed for their muster stations. For within minutes of the impact, the Andrea Doria had taken on an alarming list to starboard. One passenger on the starboard side just aft of the area of the collision articulated what must have been on many minds. Mrs. Richardson Dilworth awoke to find her husband, the mayor of Philadelphia, on the floor between their beds. She had recently read Walter Lord’s best-selling account of the Titanic sinking, A Night to Remember. “I think we have hit an iceberg like the Titanic, she told him. She was clearly wrong on one count. Icebergs don’t make it as far south as Nantucket. Whether the fate of the Andrea Doria would resemble that of the Titanic remained an open question as the ship’s list grew sharper. Within a few minutes of the collision, the list exceeded 20 degrees, a point beyond which the system of watertight compartments was compromised. At least one and as many as three of these were open to the sea, and any list beyond 15 degrees meant water would spill forward and aft. On the bridge, Captain Calamai knew only that his ship was doomed, but not how long she would stay afloat. He probably realized, however, why the list was so sudden and extreme. The Stockholm had pierced the Andrea Doria’s hull in the worst possible place, punching through starboard fuel tanks, empty this late in the voyage, that lay deep in the compartment just forward of the generator room. As water poured into the starboard tanks, the buoyancy of the undamaged port-side tanks — also empty — exacerbated an already bad situation. To make matters worse, some commentators also believe that the ship’s builders had neglected to install a watertight door in the tunnel providing access from the generator room to the fuel tanks. Water rushed through this tunnel into the generator space, making the watertight bulkhead meaningless. Since the ship seemed likely to capsize before rescue could arrive, Captain Calamai quickly took steps to organize the evacuation of the Andrea Doria by lifeboat. But the crew dispatched to swing out the port-side boats discover that the ship’s list now exceeded the maximum angle that allowed them to do so. A surfeit of lifeboats had suddenly become a shortage. Fully loaded, the starboard side boats could carry only 1,044 of the 1,706 on board. This grim echo of the Titanic’s predicament may explain why Calamai never sounded the abandon-ship signal. Perhaps he feared a panic. 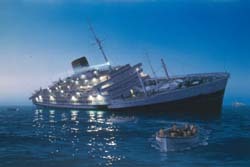 In the end, the remarkable rescue of all of the Andrea Doria’s passengers not killed as a result of the initial collision owed more to good luck than to the leadership of her captain or the comportment of her crew: though many behaved admirably and some heroically, many others did not. The first boats did not leave the ship until more than an hour after the collision, and these were packed with more crew than passengers. When the boats reached the Stockholm, which soon dispatched boats of its own to aid the sinking liner, few aboard them volunteered to return for others. Most of the first- and cabin-class passengers aboard the Andrea Doria waited for almost three hours at their muster stations without any word from the ship’s commander. In tourist class, matters nearly got out of hand. Many of the passengers lodged in the lowest areas of the ship had to fight their way through torrents of oily seawater in order to reach the deck. For some it took 90 minutes to make the nightmarish ascent. The arrival of the lady of the hour sounded a noble echo from an earlier era. This was the liner Ile de France, the art-deco precursor of the late lamented Normandie, captained by Baron Raoul de Beaudéan. He brought his huge liner to rest a mere 400 yards away — the fog had conveniently cleared just in time. And, though other ships on the scene, including the Stockholm, took off many passengers, it was the Ile de France that rescued by far the greatest share. At first Captain Calamai refused to leave his ship, even after he thought the last passenger and most of the crew had departed. (Unknown to him, third-class passenger Robert Hudson was still in the ship’s hospital. On painkillers for a back injury, he slept through the collision and the evacuation, but was rescued by a passing lifeboat.) Calamai still hoped she could be towed to safety before she sank, and he wanted to remain on board until the tugs arrived. Even when the list reached a calamitous 40 degrees, he preferred to stay; he would go down with his ship, if necessary. He ordered the remaining crew to abandon ship, but they refused to leave without him. And so, reluctantly, just as dawn was breaking, he stepped into a lifeboat. It was just past 5:30 a.m. 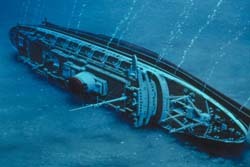 The Andrea Doria finally capsized and sank at 10:09 a.m. on July 26, 11 hours after the collision had taken place, while chartered planes carrying news photographers recorded the event for posterity. (The Stockholm, her bow staved in but her hull still seaworthy, made it back to New York under her own steam. After repairs, she returned to the Atlantic service.) Only 46 of the 1,706 passengers and crew perished in the sinking or its aftermath, almost all of them as a result of injuries sustained in the initial collision. Five crewmen from the Stockholm also lost their lives. But it could so easily have been much worse. If the Andrea Doria had sunk as fast as Captain Calamai and his officers at first had feared there would have been a catastrophe on a Titanic scale. Previous: $480 for a 35-day First Class Cruise round-trip from New York to South America in 1939. Next: GOODBYE 1929: The Death of the Roaring Twenties. HELLO 2011: The beginning of the second great recession a.k.a. “depression”…? History does repeat itself.